You’ve done a lot of good work in Zionsville, which is clear from clicking on the “Zionsville” tag at the end of the post. That is a nice feature of the blogging format, but I doubt many blog visitors take advantage of the opportunity. I mention this because I think it is relevant to the concept of documentary work. It seems to me that part of the documentary idea is the editing process where selection and presentation come into play. Of course, technique is important too, and your choice of Abbott as a guide is a good one. There was a time early in my career when I was a writer/author of technical books. I developed some pretty decent indexing skills in those days and try to apply them here. I am not as consistent as I want to be but am consistent enough that you can click on a tag and see probably 90+% of everything I’ve published here on that subject. 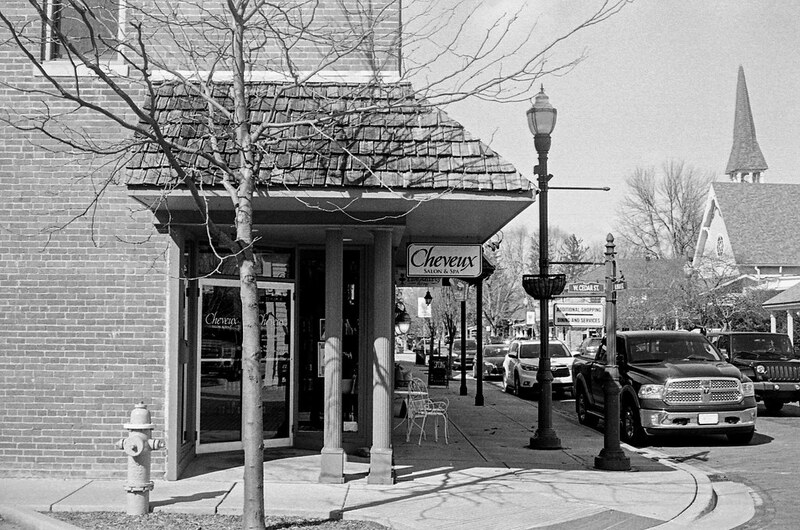 Downtown Zionsville is a great place to take a photo walk. It’s almost too great, really — it’s not challenging to compose an interesting photo. My wife and I have talked loosely about maybe moving up the road to Lebanon, the county seat. Its downtown is not as charming as Zionsville’s, not by a mile, and would present a greater challenge to portray in interesting ways. It isn’t the lack of intersecting planes, it’s the lack of classic cars! You should have hung around until those new age shapes left the shot. Still a good one !! good shot ! veri nice !